Well, if there’s one way to cheat death, it’s to completely change your identity. Post Malone has nearly died three times this year — there was a plane malfunction, a car crash, then an armed robbery — all because he’s probably been cursed by a box. (Just go with it.) 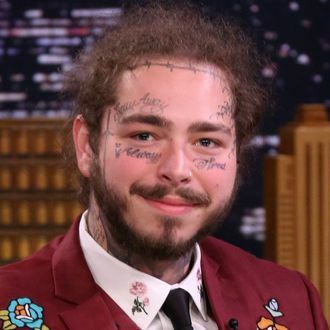 And now, Posty has gone undercover, rendering himself unrecognizable by changing his most defining feature except for, you know, all the face tattoos — but that’s probably next! Post Malone cut off his hair. He’s gone for the big chop, freeing himself of all of those matted tresses (which, he claims, ended up in two unmanageable dreads and just had to go) so that he can go on living undetected. But to throw death even further off his scent, Malone is even switching careers. Variety reports that he’ll make his film debut in Mark Wahlberg’s new Netflix movie Wonderland, adapted from Ace Atkins’s novel Robert B. Parker’s Wonderland from the Spenser series. New Post Malone, who dis?